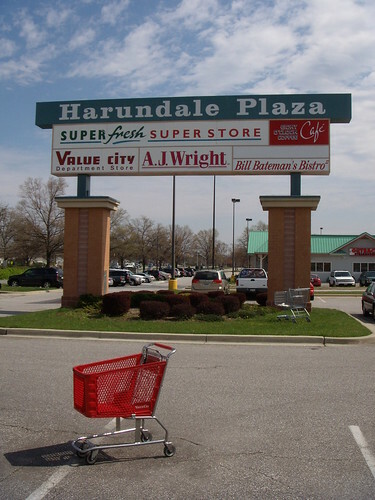 Harundale Plaza, in Glen Burnie, was built in 1958 as Harundale Mall, the East Coast's first enclosed shopping mall. Harundale Plaza isn’t as busy as it used to be on a Saturday afternoon. A shopping cart sits in front of the giant sign at the entrance, waiting patiently for someone to come along and claim it. There are still more cars in front of the Value City than there are in front of the Glen Burnie public library, across the street, but not many. At the center of Harundale Plaza, beneath a fake clock tower, is what appears to be a rock but, upon closer inspection, is merely sculpted concrete, sanded down on four sides. There’s an inscription on each side: “Harundale Mall, Opened: October 1, 1958.” “National Association of Builders Neighborhood Development Merit Award.” If you close your eyes, you can imagine the bustling shopping mall that once surrounded that rock, a trendsetter for a time that has long since passed. “Harundale Mall shoppers will enjoy perpetual springtime,” boasted the original promotional literature. Patrons were able to enjoy lushly landscaped plazas, a fountain, a cage with exotic birds and a sidewalk café – all under one climate-controlled roof. It was the first center of its kind on the East Coast and only the third nationwide. “No one in this part of the country had seen one” before, said architect Frank Taliaferro. Developer James Rouse, who would go on to revitalize Baltimore City while building entire cities of his own, was so excited about the concept of an enclosed shopping center that he originally proposed calling it Harundale HASS, for Heated, Air-Conditioned Shopping Street. It was every bit as groundbreaking as anticipated, attracting huge crowds and dominating the Baltimore market for decades. Yet, through its decline – and the rise and fall of hundreds of other American malls – we can follow the shifts in American society over the past half-century. 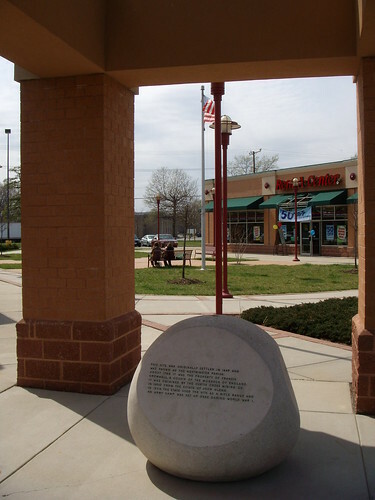 The founding rock at Harundale Plaza, originally located in the center court of Harundale Mall. The enclosed, self-contained shopping mall, while seen as a uniquely American invention, had a brief heyday in Paris during the nineteenth century. Over 150 fully enclosed, gas-lit “shopping arcades” were built throughout the city, offering an “industrial luxury” and “a world in miniature, in which customers will find everything they need,” according to travel guides. Often just narrow streets covered (at the collective expense of the shop owners’) with a glass roof, the Parisian shopping arcade was a far cry from the sleek, wide corridors of their future American counterparts. The arcades were not successful for long, quickly eclipsed by larger, more-convenient department stores, and became the territory of flaneurs, or as an American mall manager would call them, loiterers. Today, only twenty of the original arcades remain, some of which are open and restored to their original grandeur. A century later and across the Atlantic, American cities were failing as their suburbs experienced a population boom. The newly relocated children and housewives of these suburbs were suddenly isolated from the central cities that, for the time being, they were still reliant on for shopping and entertainment. The developer-funded streetcar lines that had connected earlier suburbs to the city had been bought up by large corporations like General Motors and dismantled altogether, while the Federal Highway Act had yet to be passed, which didn’t matter so long as most suburban households still had only one car, currently in the hands of the breadwinner at work. To William H. White, who wrote The Organization Man in 1956, the suburbs were merely “sororities with kids,” leaving housewives stranded. In the new super-subdivisions like the Levittowns, shopping centers were few and far between, and those that existed were not easily accessible by foot. For retail developers, an entire market had just formed. It was a wildly idealistic architect named Victor Gruen who would resurrect the idea of the enclosed shopping corridor upon emigrating to America at the onset of World War II, right as the Nazis has invaded his native Austria. Gruen was inspired by the Ringstraße, the grand mall in Vienna where “Viennese of all backgrounds could mingle freely,” and Central Park in New York, his adopted home, which both provided “entertainment for all comers." Gruen sought to bring the positive features of those urban environments to the suburbs, attempting to do so with Southdale Mall, his first enclosed mall, built in Edina, Minnesota (outside Minneapolis) in 1956. With “artificial lights, giant show windows, and fancy façades for his stores” in Gruen was able to effectively recreate downtown within a safe, enclosed space, and people welcomed it as an antidote to the filth and crime of the city . Garden State Plaza, another Gruen mall built a year later in New Jersey, included “movie theaters, bowling alleys, skating rinks, playgrounds, and meeting rooms for community organizations,” baiting patrons to shop after their other events were over. Young people, who had previously complained that “if you don’t have a car, there are fewer places to go than in town” now had somewhere to go, and they went in droves, creating what would eventually be called the “mallrat” culture. Teenagers were the first to make the mall a “town square,” and while they weren’t always welcomed, they remain “the ones whose love for the mall is pure and constant and unshadowed by doubt or ambivalence,” writes Paco Underwood. He notes that their eagerness to buy caused retailers to take notice. As the baby boom came to a close, population growth peaked in the Washington, D.C. area, and throughout the nation . Mall growth continued unabated, as more and more suburbs were built, highways were built and extended, and land on the fringe of town became more and more accessible. The 1960’s saw the first regional malls, aimed at serving larger populations than neighborhood malls like Harundale, which had less than half a million square feet of retail space. Regional malls had at least a million square feet of space. 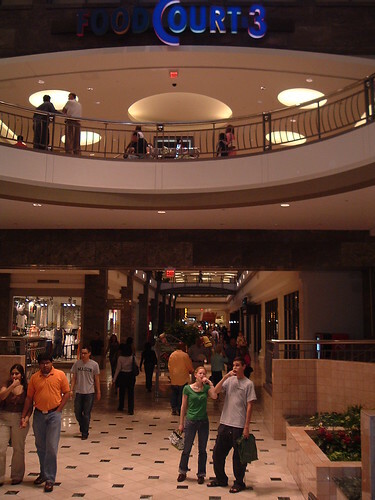 They included the King of Prussia Mall in Upper Merion Township, Pennsylvania, built in 1963; South Coast Plaza in Costa Mesa, California, built in 1967; and Tysons Corner Center in Tysons Corner, Virginia, built in 1968, the largest single-story shopping center at the time and a regional attraction from the time it opened. When a delegation from Peking, China visited Washington, D.C. in the 1970’s, they “wanted a stiff dose of America,” according to Joel Garreau, leading them not to the monuments but to “Broomie’s,” or the Bloomingdale’s in Tysons Corner Center. Center court at Tysons Corner Center in Tysons Corner, Virginia. The proliferation of malls, both big and small, meant that the design process became both more varied and more standardized, as regional markets grew more crowded and shoppers more discerning. Malls of the 1950’s were nothing more than a single corridor lined with stores and “anchors,” usually department stores, at either end. Décor usually consisted of fluorescent lights, white walls, and either carpeted or tile floors. In the 1960’s, mall design became more sophisticated, but to lower prices, “prototype” designs were created. Alfred Taubman was the largest developer to use a prototype, building nearly two dozen malls from 1967 to 1990 with the same basic interior layout and fittings . The owner of what is “widely considered one of the finest collections of shopping malls in the world,” Taubman had mall design down to a science, reflecting how suburban consumers had quickly become just another marketing segment . “For a suburbanite . . . experience comes filtered and pre-ordered. The range of experience has been pre-selected and highly narrowed,” said Dr. Dorothy Lee, an anthropologist at Harvard, in 1960. 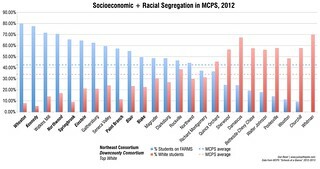 “In the suburb, no less than in the city, the individual is viewed and dealt with as a representative of a category, rather than as a person in his own right." Taubman's Marley Station Mall, located in Glen Burnie, Maryland, features his trademark concept of "adjacencies," or placing similar stores near each other to maximize sales. It was that approach that made Taubman’s malls so successful. In “Terrazzo Jungle,” an article in the New Yorker, Malcolm Gladwell states, “if Victor Gruen invented the mall, Alfred Taubman perfected it.” He used the timing and placement of lights to mimic daylight even after the sun went down; organized stores around triangular or diamond-shaped plazas to maximize views and make the corridor less monotonous; and graded every mall site with a slope so that the majority of parking spaces and mall entrances were on the second floor. “People flow like water,” Taubman said. “They go down much easier than they go up,” meaning that they are more likely to see the entire mall if they have go down stairs. 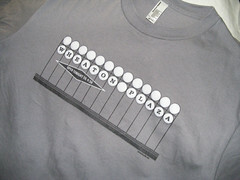 He also pioneered the concept of “adjacencies,” or placing stores that would attract similar customers near each other. 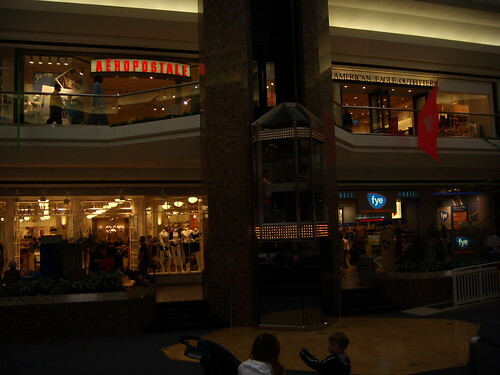 Standing in the atrium of his Marley Station Mall in Glen Burnie, Maryland, built in 1987, a consumer today can see American Eagle Outfitters and Aeropostale, two clothing stores catering to teenagers, on the upper level, in front of an elevator; below them, there is a Forever 21, another clothing store for teen girls, and a For Your Entertainment, a record store. If a shopper decides to go into one store, there’s a higher chance that they’ll go into one of the other stores if they’re next to each other. This meant higher profits for the stores and higher revenues for the mall developer, which meant even more malls. Between 1964 and 1972, the number of shopping centers nationwide doubled to over 13,000. In the Washington-Baltimore area, mall construction continued unabated during the 1970’s, as eighteen malls were built in the region. Four of those malls were in wealthy Montgomery County, Maryland, evenly spaced every couple of miles along Rockville Pike, the county’s main “shopping street,” from the D.C. line to Gaithersburg, twenty miles away. Meanwhile, women had been entering the workforce in droves since the early 1960’s, a trend which fully took hold a decade later. Joel Garreau calls it “an article of faith” that couples will choose to live closer to “the job of the spouse who does the evening cooking”; as a result, office developers and corporations chose to locate in the suburbs, near where families were already living. The suburban “hot spots” solely devoted to shopping changed once again: now, they were places to shop and work, and the “edge city” was born. Households now had two income earners, meaning that mothers no longer served as chauffeurs, but rush hour traffic increased dramatically. The time for weekly family trips to the mall had all but vanished, and it was becoming clear that the heyday of the enclosed mall may soon pass.